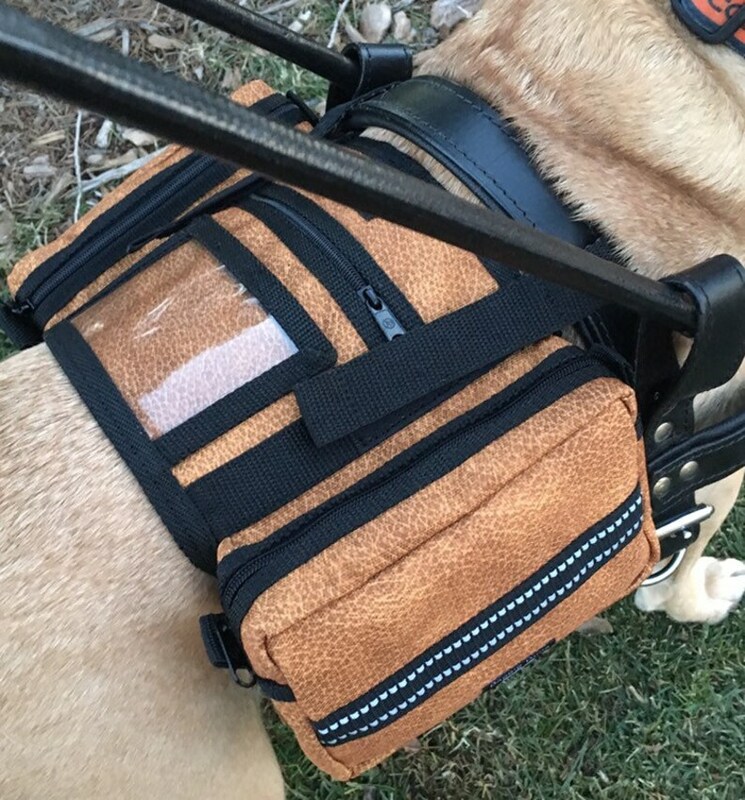 This listing is for a VEST that can be attached to different Service Dog harnesses and also nylon harnesses. A HARNESS IS NOT INCLUDED! VEST ONLY! If your Service Dog wears a harness then this may be for you! This vest is very handy and will attach to several different types of harnesses. It has two long 1" wide straps that can either run through the D rings of a harness or wrap around a harness that does not have D rings. The straps fasten onto themselves with industrial strength velcro and also have a small padded area with a grippy material to help stabilize the vest. The side pockets on this design are much deeper than on my original design and this vest also offers a zippered center pocket and a large clear ID pocket. It has reflective stripes on the side pockets to help keep you and your dog safe and visible while out at night. Straps for attaching to a harness are set approx. 7" apart. An adjustable elastic belly strap with a quick release buckle keeps the sides of the vest from flapping. Shown attached to a guide dog harness made by Hilason, a plain nylon harness and also shown on one made by Activedogs. Once again, a harness is not included in this listing! They are only shown to convey how this product works! This is a free standing vest as shown in the second picture! Last picture was taken with flash to show how reflective the stripes are. This is a limited edition fabric color called "brown leather" and will only be available while supplies last. Vest measures 7" front to back x 17 1/2" side to side. Straps for attaching to the harness are set at 7" apart. For medium to large dogs 45 - 90 lbs. (Shown on my 45 lbs tan dog and my 78 lbs Doberman).